On January 17 we published the results of our eSport-study 2019 at a press conference. For the study we asked over 1200 amateur and professional esports player about their health-related behavior and their training habits. The results: room for improvements in both areas. 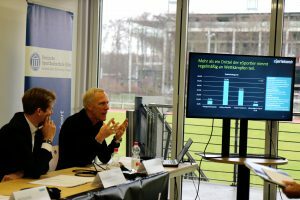 Professor Dr. Ingo Froböse, head of the Institute of Movement Therapy and Movement-oriented Prevention and Rehabilitation at the German Sport University Cologne, presented the findings of the eSport-study 2019. He got supported by Rolf Buchwitz, assistant chairman of the AOK Rheinland/Hamburg. Of the mostly male respondents (91 percent), about 84 percent operate actively in classical sports like football or fitness training. Nevertheless, only 60 % of them reach the recommend minimum of two and a half hours of physical activity per week. To make things worse, every fourth participant is obese. In addition to their job or studies, many esports players spend a lot of their free time on the computer or the video game console. On average, the participants are playing about 25 hours per week, which in consequence often causes a lot of sitting time. A structured or well-coordinated training is a rarity, even in the professional esports scene. Only every third player practices explicit content like game mechanics, tactics or communication. Numerous esports players are doing fitness exercises already, but the spent time on these activities is too low right now. Beside that, a planned or well-coordinated training in esports is still an exception and is done, if anything, only by professional players. Based on this data from the eSport-study 2019 and our assessment battery, a concept for training and health promotion will be generated. We want to guide the players towards a structured and purposeful training to sustainably improve their in-game performances and their health status. A detailed report across the eSport-study 2019 can be found under research findings (only in german available).